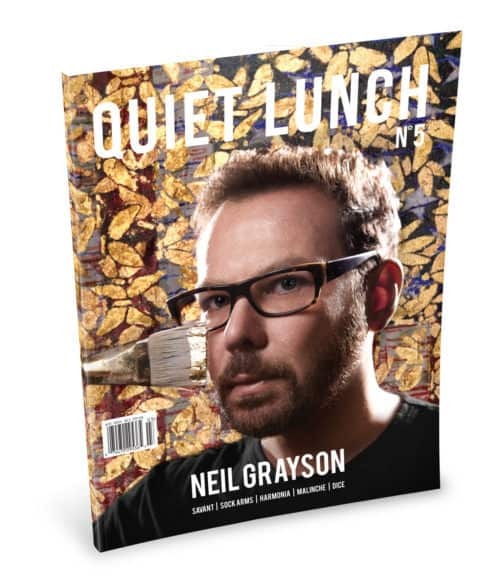 Film Poetics: Spotlight on Guillermo del Toro | | Quiet Lunch. “Film poetics” is a term which runs parallel to the David Bordwell theory of the “historical poetics of cinema” in that it looks at the specifics of film production. Film poetics takes this a step further in stating that everything that goes into a film (set design, writing, lighting, wardrobe) harmonizes with the vision of its director to create one body of work. Much in the way poetry works, the physical creation of a film is structured and layered to evaluate themes and explore truths. In this Quiet Lunch series, we will be taking a look at how directors use the conventions of poetry to build a connection with their viewers through the visual medium. John Carpenter once said, “To make Michael Myers frightening, I had him walk like a man, not a monster.” During the 1930 and 40’s, monster movies took center stage in cinema zeitgeist. It was this era which gave us Frankenstein (1931, dir. by James Whale), King Kong (1933 dir. by Merian Cooper and Ernest Schoedsack), and the Bela Legosi 1931 classic Dracula (dir. by Tod Browning). The monster genre, and film making as a whole has taken a backseat to the current horror movie stock opting instead for putting the violence front and center and relying on jump scares for box office draw. What current movies lack, and what those prior films supplied in amazing abundance, is the connection humanity has to these so-called “monsters.” What made the horror movie classics truly terrifying, and almost beautifully so, were their ties to humanity, both physically and spiritually. Since 2004, Guillermo del Toro has been one of the most popular directors working today. With his comic book film entry in Hellboy (2004) and what many consider his finest film to date, 2006’s Pan’s Labyrinth, del Toro’s name has become synonymous with fairy tale style narratives and horror movie monster designs that evoke the old Gothic structure. His current film The Shape of Water won Best Picture in the Critic’s Choice Awards, a Producers Guild Award, as well as a Golden Globe for the Director himself. Not to be outdone, The Shape of Water is now nominated for thirteen Oscars including Best Director, Production Design, and even Best Picture. It is safe to say that what makes The Shape of Water such a standout film worthy of the praise is del Toro’s ability to craft likable characters, and yes creatures, within believable worlds. While Pan’s Labyrinth was a passion project del Toro seemed to pour himself into with stunning results, what makes The Shape of Water a culmination of his scope and vision is that, more than any other film of the last decade, it is a masterfully told love letter to Gothic storytelling. Gothic film (as well as Gothic literature) revolves around shadows and lurking monsters. It delves heavily into the establishment of the story’s setting: darkly lit corridors; castles looming in the night. The Gothic genre is sometimes paired with Horror, yet there is one simple aspect which sets it apart. Alongside the gloomy settings and terrifying beasts, there is also an undercurrent of sexuality and romance. Couple this with suspense, eroticism, mystery, and terror and one would think that more production companies would be behind Gothic films. The Shape of Water‘s success is due to its exclusivity in the genre as well as del Toro’s ability to bring these characters to life. The movie, on the surface, sounds fundamentally familiar. A young lady by the name of Eliza (played masterfully by Sally Hawkins) was rendered mute after a childhood accident. Eliza lives her life through the strict routine (one which del Toro gleefully cycles by using the cadence of an egg timer). Her inability to speak and continued silence comes to represent a voiceless approach to living life. thankfully, this in no way hampers the energy and vigor she exudes during the film. Eliza is outgoing, brave, and even confident in her sexuality (again, simply watch the egg timer scene). As a foil to her quiet yet strong character, in the same way, a poetic line can contain joyful words but in a macabre timbre, she clashes with Richard Strickland (played by Michael Shannon); the new head of security at the research facility Eliza works at. As the two are set to decide the fate of an aquatic humanoid being housed there, they are instantly at odds. Richard is brash, violent, yet calculated (brought out even by his choice of candy)- directly opposed to Eliza’s thoughtfulness and compassion. He cares about his family but also lashes out when his authority or work ethic is called into question. These two combustible elements become the opposing forces in the film, but del Toro wisely spends much of the movie’s time having them run parallel to one another with very few intersections. Shortly after a riveting escape sequence, these two characters are thrown into two separate paths. Eliza struggles with balancing her attraction to the creature versus setting it free, while Strickland sees his life crumbling after a severe fall from grace. When these two characters do share scenes together (something that del Toro expertly keeps to a minimum) there are fireworks. Sally Hawkins’ face and bodywork as a tool to defy the gritty tone of Michael Shannon’s voice and stature. And endure you must. As the movie draws closer and closer to its bloody climax, del Toro carefully sculpts tension as these characters become more at odds with each other. This adds to a beautiful sense of dread as the film continues. The audience begins to sense the violent clash looming for these two characters in the future. This climactic scene, while heartbreaking, serves to emphasize the fact that they are intertwined to exist as the other’s counterpoint. The way these characters use their bodies, either to hide their true intention or to fully reveal themselves, can be seen in other characters as well. Octavia Spencer’s Zelda is constantly talking about the physicality of her relationship with her husband while hinting at her dissatisfaction with her objectification. 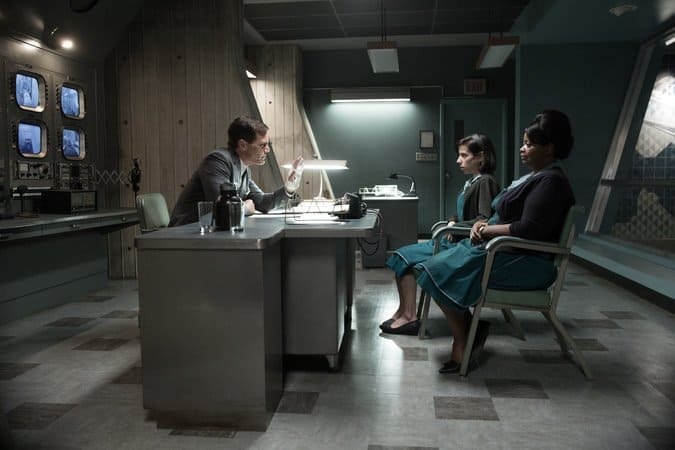 Dr. Hoffstetler (played by Michael Stuhlbarg) is a Russian spy who, while originally on a mission to steal the creature from the American compound, finds himself at odds with the orders he has been given. Finally, Giles (played by Richard Jenkins) is Eliza’s next door neighbor and confidant who is dealing with his problems fitting into society. These tiny threads only heighten the tension building between Eliza and Strickland and serve to further the way in which all of their lives are intertwined. Of course, the central figure which binds all of these characters together, as well as the thoughtful narrative, is the creature itself. Like Eliza, it lacks the language in order to communicate its emotions. Yet, like Strickland, it is imposing and powerful. Like the Gothic creatures of early cinema, the humans surrounding the “monster” are trapped within its orbit. 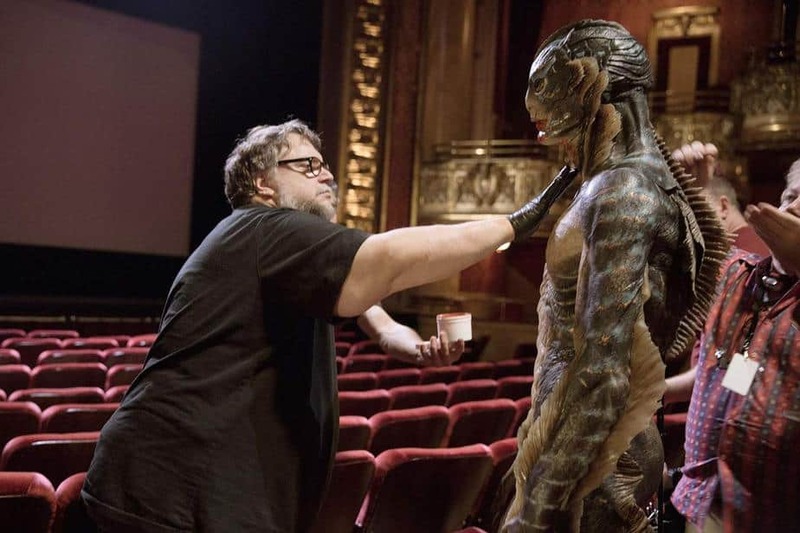 del Toro, even in his earlier films, expresses a fascination with actors who can use their bodies to convey a character’s true intentions, and this can be clearly seen in how Doug Jones brings the amphibious creature to life. The audience connects to this otherworldly being because the way del Toro manages to mix its vulnerability with its viciousness. And yes, there is violence to be had (yet in less frequency than in Pan’s Labyrinth, for sure). The marriage of beauty and violence has become a del Toro staple. The severed fingers Strickland bares for most of the movie, as well as how the reattached fingers begin to smell and rot away, become symbolic of the fate he is now bound to. For Del Toro, bullet-ridden bodies and decapitated cats are callbacks to his horror background, but also reflect the beauty of natural law and human fragility. Yes, blood must be shed in a del Toro film (and superbly created with his effects crew), but poetically is speaks to the way our bodies are only part of the stories. Eliza bares scars from a troubled and mysterious path, and while we never fully get answers as to why del Toro’s passion for creating Gothic fairy tales seduces his audience into acceptance of the story unfolding before them. 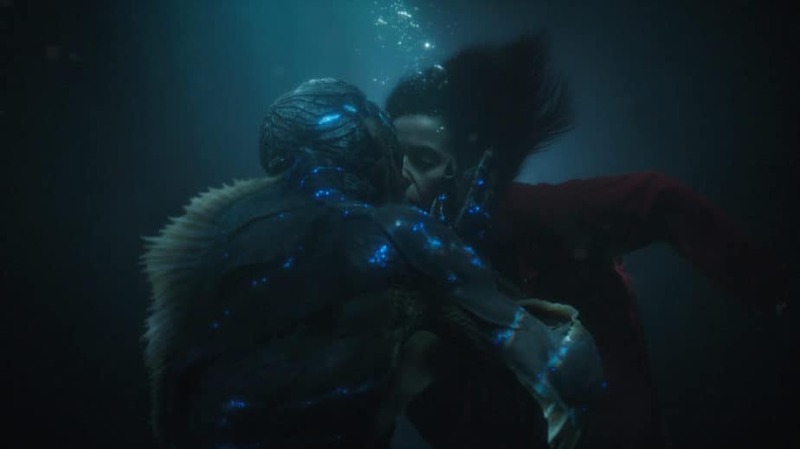 From the clothes and special effects to even the amazing soundtrack built by Alexandre Desplat to marry with the artistry onscreen, The Shape of Water is more than a movie where beauty meets beast. Guillermo del Toro is revealing himself as a visionary in storytelling through film poetics. Simply by watching the beauty of the opening scene, told entirely in a submerged silent world of darkness and awe, can one come to the conclusion that del Toro is evoking the themes of the Gothic form that will be spoken about for many years to come.